Show us your patches, and tell us a little about them. 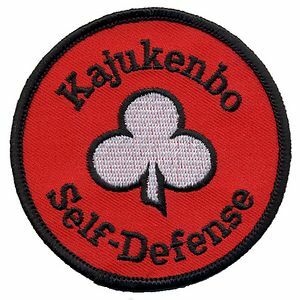 I saw a few patches at kajukenbo.org I can't remember which ones they were, but I think there were around 10. It also gives the name of the person. I, too, would like to see patches from others places. If I can get the scanner working I'll try to get ours done. If not, I guess I have to wait until my good computer comes back from the computer doctor and I can use the digital camera. Here is Prof. Alan Carter's new patch that has been updated. IMHO it is 10 times sharper with the new clover. This patch is designed off of Prof. Sid Asuncion's original patch. 1. 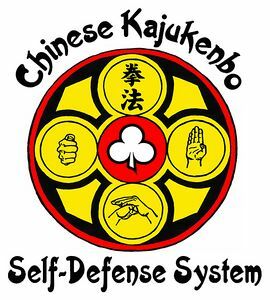 Black, White and Red are the basic colors of the Kajukenbo Self Defense System. Each representing the basic colors of promotion. 2. 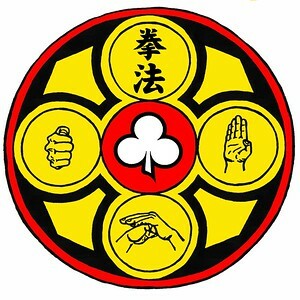 The CLOVER represents Sijo Adriano Emperado the founder of the Kajukenbo Self Defense System. 3. GAYLORD'S METHOD represents our immediate Professor, Charles H. Gaylord, and his specific method/knowledge of the Kajukenbo Self Defense. 4. The GREEN and GOLD are organization colors blended in or mixed to make unity on emblem. GREEN being young and strong, while GOLD represents the richness pertaining to the arts. 5. The RED CIRCLE around the Yin/Yang is the continuous flow called Chi or Ki meaning Universe or Universal. The RED CIRCLE also represents the Hardness and Softness in this system bound together by the continuous flow. RED CIRCLE: Hard to Soft, Soft to Hard, Kenpo, Kung-Fu, Kenpo Karate, etc. 6. The GOLDEN OCTAGON represents the techniques in TAI CHI CHUAN, PA-QUA and the eight basic directions of attack and defense that differ from Karate's basic front, back and side movements. 7. The CHINESE CHARACTERS in Red on the left mean: CHUAN FA, Fist Way, or Kenpo. The CHARACTERS in RED on the right mean: Kung-fu or "skill accumulated through hard practice and time." 8. The GREEN REED represents an organization striving for knowledge. Note: the GREEN REED points upwards towards the clover, aimed with knowledge to achieve the white cleanliness of the Body, Mind and Spirit. While the GREEN REED represents knowledge, it also stands for the symbol of the LIL LUM system from which all of our arts came from. The stem of the right also represents the TIGER while the stem on the left represents the DRAGON. "TIGER AND DRAGON IN CONFERENCE." 9. The five colors on the patch represent the five basic systems used in the Chinese Arts. HUNG, LI, MO, CHOY and FUT. The five originals of the Kajukenbo System are: Choo, Holck, Ordonez, Emperado and Chang. The five arts which make up the Kajukenbo are: KOREAN KARATE, KODENKAN JUDO, JU-JITSU, KENPO and CHINESE BOXING (Kung-Fu). The five basic systems of the Chinese Martial Arts are: HUNG - power punches, KI - pokes and slaps, CHOY - kicks and side punches, FUT - sliding techniques, NO - blocking and breaking. All of the techniques or systems are greatly used in the Kajukenbo style of defense., You could actually say that the Kajukenbo style is the Hard Style of Kung-fu. A discussion of the symbol that has come to further represent Bruce Leeâ€™s Martial Art must include an explanation of â€œJun Fan Jeet Kune Doâ€� and what it means. JUN FAN JEET KUNE DO Â® is the official name of Bruce Leeâ€™s martial art. Many are familiar with the short form name, Jeet Kune Do, as coined by Bruce Lee in 1967. However, since Bruce Leeâ€™s passing many people have attempted to teach and capitalize on the name of Jeet Kune Do, as well as Bruce Lee, and a lot of incorrect information about the art has circulated for decades leaving in its wake a confusion about the teachings and the intent of the art itself. And so, Bruce Leeâ€™s art was renamed Jun Fan Jeet Kune Do as a way of separating it from the chaos that has ensued since his death in 1973. The name is made up of two parts: â€œJun Fanâ€� (Bruceâ€™s given Chinese name) and â€œJeet Kune Doâ€� (the Way of the Intercepting Fist). The development of Bruce Leeâ€™s art from 1959 until the end of his life was one smooth and indivisible path. In the beginning, he referred to his teachings simply as â€œJun Fan Gung Fuâ€�. Later he further refined his art as a unique gung fu all its own â€“ Jeet Kune Do. And now, in an effort to delineate it once more, we at the Bruce Lee Foundation in accordance with the Heirs of Bruce Lee hold out to the world the name of Jun Fan Jeet Kune Do as the guiding light for the authentic teachings of Bruce Lee. Jun Fan Jeet Kune Do refers to the art itself as taught by Bruce Lee and as intended by Bruce Lee in his lifetime. The above symbol represents the wholeness of Bruce Leeâ€™s art as the evolutionary process of one man and his teachings. Wherever you see this symbol, it refers to the authentic teachings of Bruce Lee as continued by his family, select students and the Bruce Lee Foundation. The rest of the symbols from the school defined; on the belts is the symbol for courage, the Blue Kanji in our patch and on our school logo, mean PASSION (left side) and WARRIOR (right side), the three pronged symbol in the Yin/Yang is the symbol for the God of War (to watch over us, hopefully so we don't have to fight). The Idea for our school patch is to blend the arts of Gaylord Kajukenbo and Jeet Kune Do and then absorb what is useful from whatever arts and ideas we find. Learning from each other all the time and evolving. As a school I hope to constantly improve and refine our skills and techniques to become the simplest, most effective they can be. I think we all need Courage to get through our daily routine, never mind the hard training at the school. "Your tombstone will have two dates on it, but its the dash in the middle that matters the most"
Wow that was very informative. Thanks a lot for that in depth explanation. A student had just asked the same question a short time ago so I had it on an email. Nothing like a little cut and paste....wax on wax off..
Hey, post up some more Kajukenbo patches . If your not sure how to post them, email the picture to me, and I'll post it. Thank you Professor Bishop for posting my patch I sent in to you. This was indeed an "old one" as it was the first patch that Great Grand Master Gaylord used in his first school in San Leandro Ca in 1963. I was fortunate to be one of his first students and I kept the original patch. Indeed as far as I know, this is the only original patch left. It reminds me of the times well spent in that school learning the old way of the old (original) kajukenbo. Thank you again for posting my old patch. Over the last couple years due to server changes, hosting sites going offline, and other reasons, we have lost most of the patch photos. I'm going to start this thread up again to try and recover these pictures. If you have a KAJUKENBO school patch that you don't see here, please post a picture of it. Many patches we had here were lost due to server changes, and various photo hosting sites going out of business. If you don't see your patch here, post it up. Nice patches. Anyone interested in selling their patches I would like to purchase one from each of the different kaju schools. I'm trying to collect them for display. Please if you do send me a PM. Thank you Prof. Bishop for posting these again.